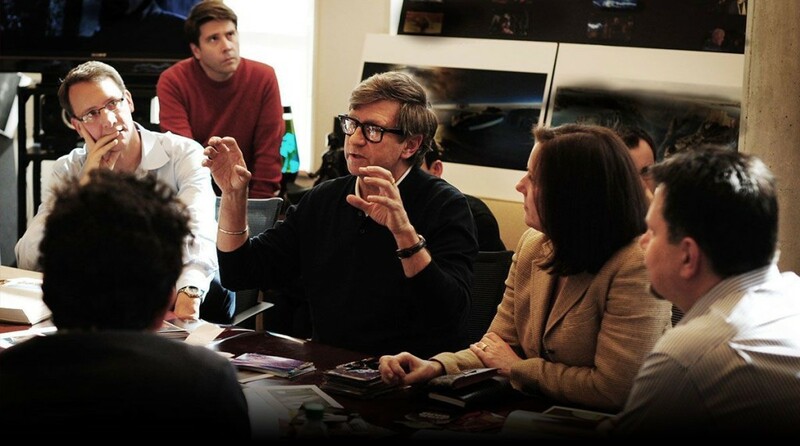 Is this Star Wars: Episode VII Millennium Falcon concept art? Is this Star Wars: Episode VII Millennium Falcon concept art? The new revamped Lucasfilm website has an interesting image on it. It sure looks like it might be! It also could be concept art of a video game or something. It is next to some pieces of things from other films in the saga. Black shirt talking with animated hands: RICK CARTER production designer of Episode VII, Avatar, Jurassic Park, and the Back to the Future sequels. Red shirt is KIM LIBRERI SVP of technology, Visual Effects for The Matrix, Super 8, and Speed Racer. Man in glasses, white shirt is JASON MCGATLIN Executive Producer of Episode VII (co-producer of Tintin). Black Shirt is JJ ABRAMS. Never heard of him. White shirt to far right is JOHN KNOLL ILM Chief Creative Officer. The Falcon appears to be flying towards an explosion. The image to the right looks strangely like some of the locations in New Mexico Latino Review suggested, but I might be looking at that image entirely wrong. In the image above, it looks like Boba Fett holding his father’s helmet in Attack of the Clones, something unidentifiable to me at this moment, Count Dooku shooting lightning from his fingers, and two images of Alec Guinness as Obi-Wan talking to Luke in Return of the Jedi. Is that the back of J.J. Abram’s head? Very interesting. Thanks to @JustinL8 of JediNews.co.uk for the heads up!